The presidential challenge coin has been in the news fairly often – most recently back in November 2016 when a vice admiral handed then President-elect Donald Trump a coin. In other instances, former President Obama was caught on camera numerous times handing coins to various service members, especially those who guard Air Force One or Marine One. What exactly does a presidential challenge coin look like though? What type of designs do they feature and when are they handed out? Let’s take a look. While it’s difficult to find any information about an official President Trump challenge coin due to him only having been in office a few months, it’s almost guaranteed that he has some sort of challenge coin to give out as he pleases. The only coin featuring President Trump currently on the White House Gift Shop website is a commemorative inauguration coin with his portrait and a “45th President of the United States” text design around the edge. This is likely NOT the coin he gives out, but rather a collector’s item for people to purchase in the gift shop. President Trump was recorded in November 2016 being given a challenge coin by Vice Admiral Dave Johnson after a security briefing at his Mar-a-Lago estate in Palm Beach, Fla. While the coin exchange usually happens in the other direction, many military personnel decide to give the president a challenge coin featuring their unit or battalion logo or other similar design. Former President Obama was a noted fan of handing out a presidential challenge coin, given the opportunity. He was often photographed giving a coin to members of the military guarding Air Force One or Marine One, and in one case, was even photographed dropping the coin mid-exchange with a marine in front of the Marine One helicopter. Obama would often give the coins to military personnel via a “secret handshake”, where the coin would be in his palm while giving a handshake to the chosen person. This made the exchange subtle and discreet, and in so doing, made it difficult to photograph. While most people who received a presidential challenge coin kept it close, it’s possible to find some information and even some pictures of what the coin looked like. On the front was a 3D molding of the White House, with President Obama’s signature below. Around the White House was gold text on a blue background that said: “Barack Obama, 44th President of the United States.” On the back of the coin was the Seal of the President of the United States. On top of giving the coins to service members, President Obama would also sometimes leave a presidential challenge coin on the headstones of fallen soldiers at military cemeteries around the nation. President Bush was another big fan of handing out challenge coins when the opportunities arose. Bush often gave coins to the family members of soldiers killed in action overseas. The President Bush challenge coin was similar to the Obama challenge coin, featuring a 3D mold of the White House with “George W. Bush, Commander in Chief” text on the front and the Seal of the President of the United States on the back. You can find a picture and an anecdote from a recipient of the coin on The E-Sylum, the electronic publication of the Numismatic Bibliomania Society. President Clinton was an avid collector of coins and kept a display on his desk with various coins he had received from service members throughout the years. 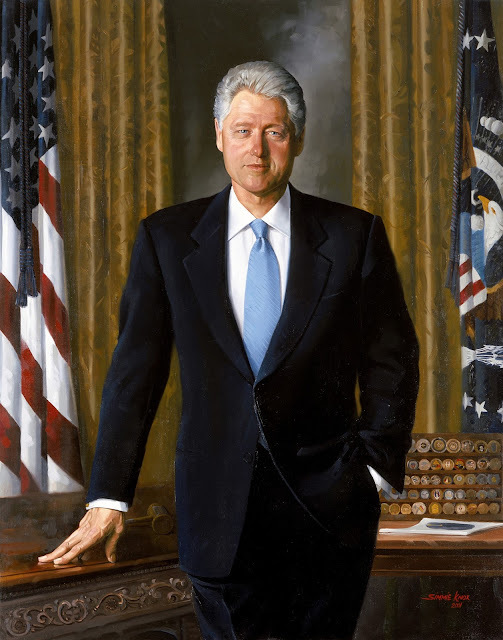 The coin display was even featured in one of Clinton’s official portraits in the background of the painting. All in all, there’s no denying that the presidential challenge coin is shaping up to be a tradition that’s just as prevalent as the actual challenge the coins are named after. ChallengeCoins4Less is excited to see what kind of coins our current and future presidents design to hand out to the public!